Decorative aroma lamps will add flair to any room. 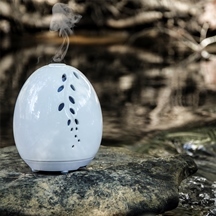 Use these oil burners to create a pleasant ambiance using fragrance oils or essential oils (which are also available from Wellington Fragrance). Wellington Fragrance offers a complete selection of oil burners, including: lamp rings, ceramic oil burners, four styles of soapstone oil burners, brass oil burners, pewter oil burners, beaded oil burners. Aroma lamps make a great gift for most any occasion. All aroma lamps are available at wholesale rates, with a greater discount when bought in bulk quantities of twelve.